Good morning everyone! I am not a cakes person. In fact, I’m not a sweets person at all. I make tons of desserts, don’t get me wrong. It’s just that I don’t eat them. Now, give me a bar of dark chocolate and then you’ll see me eat! In fact, I usually carry a bar of dark chocolate inside my purse. Yes, it’s true. Ask my kids. Ask my friends. It’s my guilty pleasure during my hectic days. I decided to up the chocolate infatuation a notch and take it to Shabbat level, sort of speak. 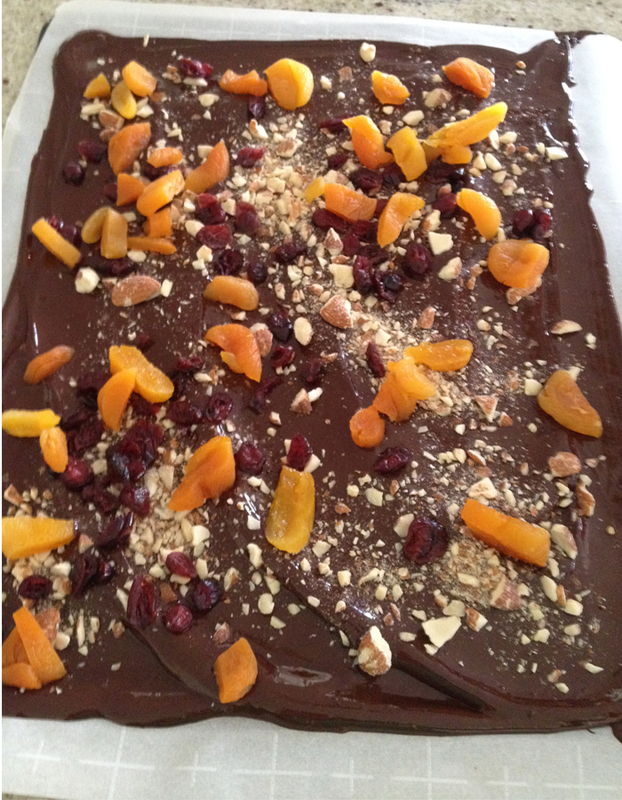 I started treating myself, my family and guests to the easiest dessert ever to satisfy my chocolate cravings – Chocolate Bark! The key is to buy good dark bittersweet chocolate. The other, very important trick is to keep the layer of melted chocolate very thin. Any nuts and dried fruit that you want. I like to stick to three or four: Almonds, Walnuts, Apricots and Craisins. But, you can add walnuts, pecans, and others if you’d like. If your nuts are whole, crush them a bit in the food processor (you still want them in chunky pieces). Chop your dried fruit also into smaller pieces if you need to. Shred the block of chocolate in the food processor. Melt the chocolate in the microwave 30 secs at a time, mixing in between. Two or three 30 second intervals in the microwave should be sufficient. Line a cookie sheet with parchment paper. Pour the melted chocolate on the parchment paper making sure to make a very thin layer. Sprinkle your dried fruit and nuts. Put inside the refrigerator or freezer. When it’s completely hard and you’re ready to serve it, crack the large sheet of chocolate into uneven pieces and lay on a platter. It looks gorgeous and is just as good as it looks! Whatever you can’t fit on your platter, save in a zip lock bag and put in the freezer. Then you’ll have a great weekday snack :-).